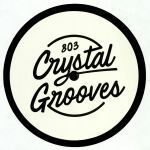 Review: Inaugurating Crystalgrooves is Berlin fixture Cinthie: a long standing figure in the underground electronic music scene of her hometown, resident at the infamous Watergate club, plus being the founder of top labels such as Beste Modus, we_r_house and Unison Wax with Diego Krause. She gets the new project off to an explosive start with these three raw house cuts. The A side features the bouncy and uplifting classic house vibe of "Together" which has an overly familiar hook to it and sure to work on the dancefloor any time. On the flip, she gets into some funked-up and discofied loops in the vein of DJ Sneak on the track "Ada Lovelace" while the moody heads-down feel of "No Need To Worry" is a perfect backroom dub if we've ever heard one. Review: Cinthie is unstoppable at the moment. 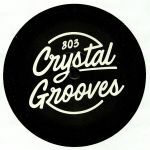 Between some great releases for Aus Music, Ground Service and We_R_House, the Beste Modus boss has found time for another imprint named 803 Crystal Grooves - and this sophomore effort showcases her love of raw/jacking analogue sounds of house music's heyday. On the A side of 002 we have the powerful acid flashback "Push It" followed by the wonky percolator jack of "The Worm" reminiscent of classic Cajual/Relief Records. On the flip, we have the dry and saturated stomper "BoomBoomRoundTheRoom" with its hypnotic guitar sample doing the do.